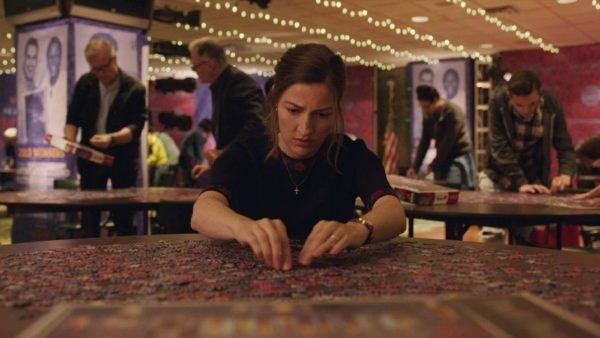 Marc Turtletaub’s highly appealing debut film, Puzzle, which opens in Canada on August 10, bores into the personality of a devoted wife and empathetic mother who feels repressed and longs for self-fulfillment. 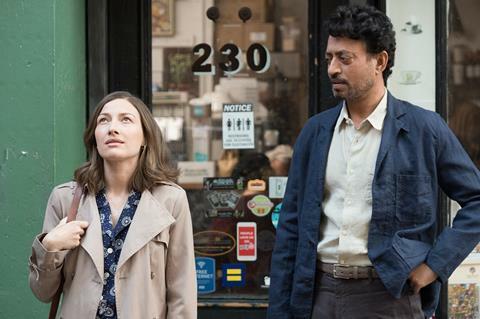 Agnes (the Scottish actress Kelly Macdonald) shares a house in Bridgeport, Connecticut, with her husband, Louie (David Denman), the owner of an auto body shop, and their two grown sons, who work alongside him. The daughter of Hungarian immigrants, she’s a pious Catholic and a submissive and dutiful woman who cooks, cleans, tends to her family’s needs and only leaves her home to shop for groceries and attend church functions. On her birthday, for which she has baked herself a chocolate cake, she opens a present that will alter her outlook and priorities. It’s a one thousand-piece jigsaw puzzle. Assembling it in no time at all, she’s filled with a sense of purpose and accomplishment. Eager to pursue her new-found interest, she takes the commuter train to Manhattan to buy more puzzles. On a wall inside the shop, she spies a hand-written advertisement from a puzzle devotee who desperately seeks a partner. Several days later, she meets Robert (the Bollywood actor Irrfan Khan), an Asian American and the winner of last year’s U.S. singles championship. A wealthy inventor exuding cosmopolitanism, he resides in an elegant townhouse in a sedate neighborhood. Impressed by Agnes’ puzzling skills, he says, “You’re a god-send.” Calm and self-confident, she’s a natural. When Robert asks her to meet him twice a week at his home to prepare for a major tournament, she readily agrees. Agnes, fearing Louie’s reaction, tells a white lie. She claims she plans to visit her ailing aunt in Manhattan. Louie is a gentle man who treats Agnes with affection and respect, but his horizons are limited. As he says, fishing is the most important thing in his life. Robert, recently divorced and lonely, is worldly and soulful, and Agnes immediately senses that. As they continue to practice, they irresistibly drawn to each other. “Can I kiss you right now?” he inquires out of the blue one day. Their platonic relationship undergoes a sea change when she acts on her impulses. Amid these developments, a family crisis erupts when Ziggy (Bubba Weiler), one of her sons, confesses he hates his job and yearns to be a chef, a trade Louie considers effeminate. Macdonald, the heart and soul of Puzzle, turns in a memorable performance as a woman who tries to assert herself and follow her dreams. She’s in virtually every scene of this mesmerizing movie. Denman’s portrayal of a simple, down-to-earth blue-collar worker is authentic and persuasive. Puzzle is a straightforward, yet complex, film that draws you compellingly into a whirlpool of conflicting emotions.